Discussion in 'Downhill & Freeride' started by downhill mike, Dec 22, 2012. How the mighty national series' have fallen. Canada down to 2 or 3 rounds and the US has such stunning venues as Plattekill, Fontana and Sea Otter. What the plan for China peak? They gonna build new stuff? Or just use existing trails? Anyone know what trails mammoth is gonna run? Please say Bullet or Upper Velocity to Techno Rock/Velocity/Chainsmoke/Twilight zone. If they run the race on UV it will single handedly return legitimacy to US DH racing. no love for plattekill? there are a few venues on this list that I question but platty is not one of them. I have raced all over the country and feel like platty has always done a great job with course. sure its not in a huge resort and lodging can be a pain but they have held a number of large races and I dont think people are usually dissapointed. When I was racing, I raced at plattekill frequently on off weekends. (thing mid to late 90s thought mid 2000s) The venue is a gigantic hole. It does not compared to park city, crystal mountain, vail, mammoth, big bear, mount snow etc. It may have gotten better, but it's still in the middle of nowhere with next to no facilities or civilization near it. This is a national level event, the course itself is important to be sure, but it isn't the only thing to consider. There's been a major changing of the guard recently, a lot of people racing were not around or even thinking about bicycles back when some of us here were racing. Many of us are now deeply embedded in the bicycle industry (and have accounts on RM) and mourn the loss of epic national series' in north america. The travel schedule has almost always sucked, save for one or 2 years where it was bigbear, then a flight to the east coast and a long trek back across stopping at 4-5 events along the way. Just to clarify that's about his sentiment towards Plattekill. I think this national series is insulting, whoever made it must be an oil lobbyist on the side. I will agree. plattekill isnt the most ideal place to get to, or stay but you cant argue its history of putting on good events. Whatever, who cares about the sh*tty venues it has. It has mammoth (FINALLY), which is probably the best resort in the country. And China Peak, which has serious potential. Big resorts are expensive and the average Racer is poor (from racing). Completely agreed about Mammoth. Best track was Crystal (2001? ), best venue was almost certainly mammoth. You're right, does look cool. Very raw. I wondered what happened to riding at that place? "When I was racing, I raced at plattekill frequently on off weekends. (thing mid to late 90s thought mid 2000s) The venue is a gigantic hole. It does not compared to park city, crystal mountain, vail, mammoth, big bear, mount snow etc. It may have gotten better, but it's still in the middle of nowhere with next to no facilities or civilization near it." Platty has been supporting the sport for 25 years and is 2 and a half hours from NYC. Big Bear views us as a liability risk. Mountian creek has had three different owners in the past ten years. Most of these other venues "Park City" that you love are corporate real estate plays and could give 2 ****s about the sport. I would rather reward a small operator who helped keep the sport alive then the Vails of this world. On another note Frasier, that platty crash was brutal. You must be made of rubber to have walked away from that. I think that was a purpose built track for the NCS event, I'm not sure that there was ever normal riding there? That was the track though. So good. Brutal rock gardens at high speed, high speed fireroad corner and then a really tight tree section at the bottom. Amazing track. Best after party of all time as well. FYI, rumor has it that Big Bear will be re-entering the downhill market soon. apparently they've signed a deal with Gravity Logic to design and build a bike park and I would bet that racing will be a part of that, as well. So many rumors for so long. Just like that alleged bike park in Santa Clarita. God d*amn it would be awesome if China Peak developed, plus Big Bear, and now with Mammoth really stepping things up. Socal would truly be MTB paradise then. yeah, i've been hearing all the rumors over the past couple years too so I don't usually jump on the rumor train but the Big Bear information comes from lots of reliable sources so I tend to think there's some credibility. Been riding with one of the China Peak guys for a while now, it sounds like the owners have big plans for the bike park but it will take longer to complete. Yeah I keep hearing more and more big bear rumors and less and less Santa Clarita rumors. So I guess that suggests something. It would be nice if China Peak decided to get real about their park. They seem to have by far the best mountain/terrain/layout of anywhere I've seen for a bike park. Tons of vert, accessed by a single lift, great dirt, great gradient, etc. They need to actually hire ya know, a trail crew though. The trail they do have are really fun though. And it's always kind of eerie having a mountain entirely to yourself. So stoked to see that event at Mammoth. If they do some good marketing and PR on the "festival" aspect of that event in major media markets they might be able to re-activate some of the tens of thousands of people that used to head up there for races in the 90's to hang out. I haven't raced the Kamikazee since I was 16! No Port Angeles or PacNW at all?! WTH? Our application kind of got lost. It's still possible that our late April date will be a GRT, it's in their hands. Is there even a need for a 'premier' national series now? I went to the Sugarbush MTB Granp Prix this past year and will not be going to any other's if they are handled as poorly as that one was. I would much rather stick to something regional that is run more professionally. All of them are ran by individual promoters so I would keep an open mind. Is there even a need for a 'premier' national series now? I went to the Sugarbush ProGRT this past year and will not be going to any other ProGRT's if they are handled as poorly as that one was. I would much rather stick to something regional that is run more professionally. There is a need, in my opinion. It helps grow grassroots racing and develop successful, experienced racers. Local, National, International. All levels are needed. As a racer gets to the top of one level, they aspire to race the next one etc. As for being badly handled, I did the ProGRT in Dry Hill last year, and it was BY FAR the best national/local race I have done in years. Had a great time, fantastic course, hotels and food nearby. It easily rivaled the IXS racers in Europe. Only downside was a lack of a bikewash directly on location for those loading bikes into cars etc. that race at sugarbush was a "mtbgp" race not a pro GRT. it was run very poorly but dont blame the wrong people. Seriously, maybe there's an entrepreneurial opportunity there for someone in PA with a water truck (or even a pickup with a tank and pump) to set up a wash station, Scott. Or you can just do the Eric Loney and bring your own pressure washer. Old balls. Damn all these acronyms!!!! Well with that said I will edit my post. But, yea the "MTBGP" I went to felt like a a huge step backwards for a "National" series. 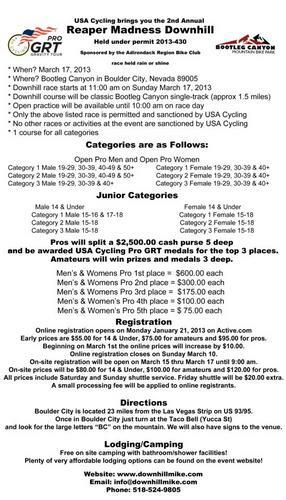 Registration Opens for the 1st Pro GRT at Bootleg Canyon on January 21, 2013. The day after the Nevada State DH Championships at the same location. 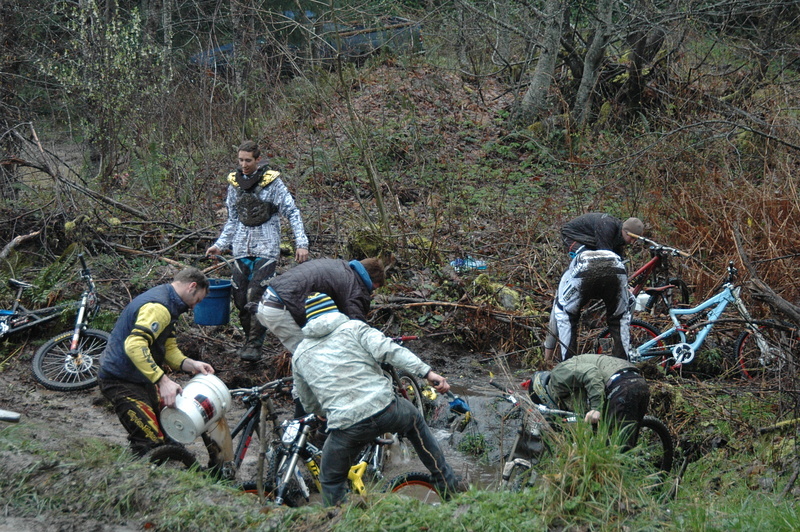 Dredging this back up to confirm that there will NOT be a ProGRT at Dry Hill (Port Angeles, WA) the week after Sea Otter this year. Application snafu that could not be resolved. Got that straight from Rachel Leif at USAC this week. All the best to Scott and the crew for getting back on board next year. AFAIK there will still be a full slate of 2013 NW Cup races regardless. Meh, it doesn't have the title, but it's still the same race. The world cup contingent is still confirmed to be there and the trails are as dialed as ever. It'll still be one of the biggest US races of the year. Ah, so the big guns are coming after all, eh? That's good news indeed. Application snafu? wtf is that? A typical governing body excuse. Best track I have ridden/raced in years was dry hill #2. So. Much. Fun. Not my place to say but don't assume the worst. Important point is what Kyle says - - will still be a great NW Cup race with top talent present. When Fontana and Sea Otter are 'Nationals' that status starts to lose its luster real fast. Pro rider Kyle Thomas is confirmed, that's all that matters. Yes it's true. We won't be a ProGRT stop, but everything else will be better than ever. Some new trails, double pro purse, and a few other extras. We have heard from the usual contingent of teams and the newly dubbed UnderWorld Cup (NW Cup #2) will be as sick as usual. On a personal note. We are starting our 6th year of the NW Cup and we couldn't be more excited. It is a year round project nowadays, but it's still fun. We sincerely look forward to seeing all the familiar faces and showing them a good time. Thank you so much to all of you who have showed up to be a part of it all. So are they just canceling the PRO GRT at China peak this weekend? I mean they claim their bike park isn't open until next month, and I can't find any information anywhere on the internet about this thing going on. Strange.